I was probably 13 the first time I heard of Centralia, Pennsylvania. A small town in eastern Pennsylvania's coal fields that wasn't too different than my hometown of Logan, West Virginia, except in one major way: In the spring of 1962, a fire ignited a coal seam and spread underground; it's still burning 50 years later. 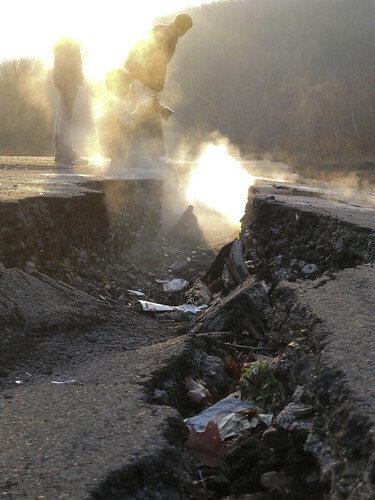 As it burned through the seam and spread into adjacent seams and into mines that bored into the hills around Centralia, the town became uninhabitable. The heat grew, the highway buckled and became too expensive to maintain, so the state of Pennsylvania shut it down. In places, still today, the ground is hot to the touch and smoke spews from cracks in the ground. It became a town forgotten, a town abandoned. Growing up in a once-booming coal town myself, I grew up surrounded by tipples (where they cleaned the coal) and smokestacks and long-empty warehouses for the shipping and receiving of coal, and the storage of mining equipment. In downtown Logan the number of empty storefronts and abandoned buildings multiplied year after year. I'd drive my grandfather to the post office and look at the empty five-story warehouse on the next block and wonder what was behind its doors. I'd be in my dad's truck headed up some hollow to some coal mine to deliver parts and see, tucked away in the folds of the hills, houses and shacks and buildings coated with years of dust and choked with weeds, even trees growing through windows and walls. I always wanted to stop the truck, get out and find out what was in there. Why was it left abandoned? Who lived there? Where did they go? I guess that's the writer in me, always looking for a story. Now that I'm a freelance writer here in North Carolina, I get the opportunity to follow these threads from time to time, but not as often as I want. A few years ago I wrote about the colonial ruins at Brunswick Town/Fort Anderson for Wrightsville Beach Magazine (two parter, part I here and part II here), a town that was one of the earliest settlements in North Carolina and was, like many ghost towns, important for many years, but faded as time wore on. I think it's time to head out to Proctor, Mortimer or Smokemont, North Carolina, to see what kind of stories I can dig up.